The Order: Two poached eggs on brown toast with beans and sausage, hold the home fries. Side of peanut butter. Coffee and OJ. And a bowl of grits…yes grits…the coarsely ground corn meal porridge popular in the Southern United States. 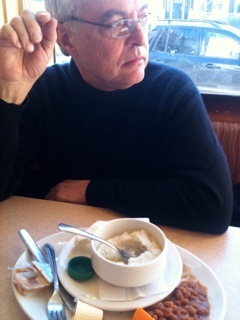 Grits are not technically on the menu at John’s, nor are they even available in Canada. Eade tells me he buys several packages of grits whenever he goes cross-border shopping in Ogdensburg, New York, and leaves one in the kitchen at John’s for his bi-monthly visits. He says John’s is the only restaurant he will go to for breakfast. The power breakfast kicks off Eade’s Saturday morning ritual of supermarket hopping. “I love grocery shopping,” he says. His regular circuit begins at the Westboro Superstore and then on to Food Basics on Kirkwood. He’ll unload the car and then go to the Metro in Bell’s Corners, followed by Price Chopper and the Beer Store. If there are good specials, Eade says he’ll also go to No Frills in Orleans. “My grocery bills are enormous!” he says with a laugh. The Method: First Eade squeezes the entire paper cup of butter into the grits and while it melts into a shiny yellow pool, he begins spreading creamy peanut butter on toast and folding that around a sausage — an unconventional culinary combination of his own design. With another piece of toast, he takes one of his poached eggs and tries to launch it into his mouth in a single bite with the yolk intact. “I don’t like messy plates,” he says referring to the runny yolk that escaped from his other egg. “I certainly don’t want my grits touching my eggs.” He gulps some coffee between bites and fills in any silences with idle chatter. There are plenty of beans and grits left when he finishes his eggs, sausage, and toast: “I don’t eat it all because I don’t want to get fat,” he says, flashing a glance over to his wife Nancy, a forensic scientist and a self-described health nut who has chosen to have coffee and pea soup for breakfast. I can’t help but to draw a connection between the way Eade eats and the way he shops for food: which is to say, obsessively. And another thing is sure: he’s filled with contradictions. On the one hand he painstakingly catalogues the crappiest food imaginable and cruises the aisles for deals every week, while on the other he can be found making his own cheese or messing around with a sous-vide machine in order to turn out dishes of succulent veal cheeks. I wanted to know where the idea of eating grits came from; had he grown up with it? Nope. Eade grew up in Southern Ontario with no grits in sight. He’s been eating grits for as long as he’s been coming to John’s, which he began frequenting when he became food editor at the Citizen in 1998. He says this was shortly after he lost his first wife when their son Graham was just two years old — the food writing gig had better hours than the Hill and he had daycare to worry about. Graham, who is now a teenager, has a penchant for luxury ingredients: only sushi-grade tuna will do. Eade himself admits that his days and nights, every waking thought and action, are dedicated to the pursuit of meal planning, grocery shopping, cooking, and capturing the minutia of the city’s food scene. At the end of the day, it’s a big bowl of bland, buttery grits that symbolizes Eade’s approach to life: the hungry pursuit for the next meal — the chasing, the finding, and the filling up on a never-ending grocery list of ingredients. Like any collector, he’s only as happy as his last great find. The pleasure of eating itself seems to be besides the point.